Thanks for considering a donation of $56, $26 or more! 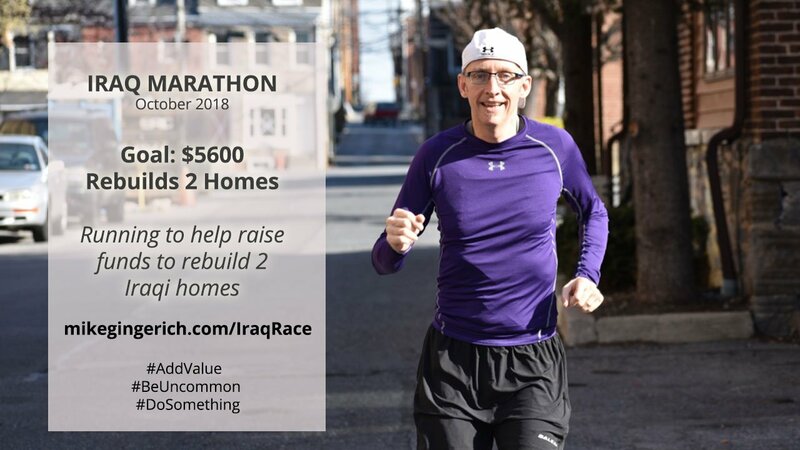 Mike Gingerich is running the 2018 Erbil Marathon in Iraq to raise $5600 to help rebuild two homes in the greater Mosul area of Iraq that was crushed during ISIS occupation and the ensuing urban battle in 2017 to free the city and restore it by Iraqi troops to Iraqi control. Mosul is the 2nd largest city in Iraq and experienced extreme devastation from the ISIS hold on the city and the battle to free it in 2017. It was the largest and longest urban warfare since WWII. Many families have no means to rebuild their damaged homes. We can help! All Donations here go fully to support rebuilding efforts. Complete the secure form to donate. iGive Global is a 501(c)3 non-profit and all gifts are tax deductible in the U.S. A receipt will be emailed immediately following your donation.